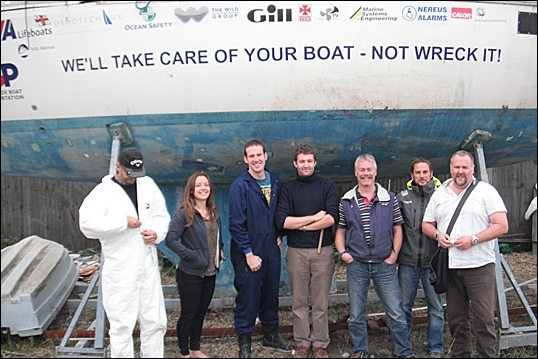 The Yacht and Small Craft Practical Surveying Course was devised by Paul Stevens (Fellow member of the YDSA) in 2006. Paul developed the course as an alternative to the many distance learning yacht surveyor qualifications, most of which lacked any practical training in working boatyards. Paul is also the author of 'Surveying Yachts and Small Craft' (Adlard Coles, 2010), which is our key text book. The course content was developed with the YDSA and the IBTC and quickly became established as the only training of its type based on practical demonstrations aboard a wide variety of yachts and small craft. The YDSA subsequently introduced a Graduate Membership grade specifically for the course and most delegates have quickly moved on from there to become Affiliate and Accredited Members. These are the marine industry benchmarks for professional surveyors. Over the years, three of our former delegates have won the annual YDSA's Leslie Oliver award for the best new surveyor as judged by the YDSA's membership committee. Delegates have also become members or delegate surveyors of IIMS, MECAL, RYA and SFIA. We moved the course from the IBTC, Lowestoft to Ipswich in 2013 to make use of the availability of a wide range of facilities available to us at Foxs Marina and Boatyard. Successful graduates from the course are also fully supported by their own surveyor organisation started by successful delegates in 2007, British Marine Surveyors Europe, www.bmse.co.uk This is a small but dynamic group with an active surveyor's forum where information is freely exchanged between members. All members can post queries with photos and get immediate help on any topic, with more experienced members making sure new developments are shared with recent members. In this way the service provided to the public and industry by surveyors from the course is constantly enhanced and a considerable contribution to the surveyor's continuing professional development is achieved. There are plenty of courses teaching the theory of surveying but very few that give you the practical knowledge. This course offers 4 weeks of intense hands-on surveying in which you will practice the techniques of the trade and see a range of problems that it would take you years to find on the job. Having been surveying for a few years I cannot see how I would have done it without the benefit of this excellent course.